Fairmeadow Farm: Fall is Here (so obviously it's time for soup)! Fall is Here (so obviously it's time for soup)! Zeus and I were talking in the barn the other day about how much we love comfort food when it gets chilly outside. I start craving soups like they're going out of style, and he just can't eat enough hay! Since fall seems to have definitely settled in (and my appetite for the fruits of summer is fading), I thought I'd post a recipe for 'Leek and Potato Soup', a classic comfort soup if there ever was one! I'm not actually sure where this recipe came from...I have it written out in my little book of favourites, and so alas, I cannot give credit were it's due. This is a yummy one, however, so I thought I'd share it just the same. (This might also have something to do with having spent two days last week digging and collecting potatoes, and happily noting the nice deep blue-green colour of the leeks every time I walk past them in the garden!). For those who haven't cooked with leeks before, the easiest way to clean them (and they need to be cleaned well to remove the grit that finds its way between the layers of the leek! ), is to first chop off the tough green leaves, but leave the root intact. Next, cut the leeks in half lengthwise, then rinse them well under cool water, separating the layers with your fingers to let the water rinse the grit out from between them (the root will keep everything together). 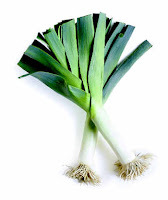 When clean, cut off the root end and slice the leek halves crossways into 1 cm wide pieces. In a large soup kettle, combine potatoes, leeks and stock. Cover and bring to a boil. Reduce heat and simmer until the vegetables are soft, about 20 minutes. Remove from heat and add the milk. Mash or puree the soup in small batches. Return soup to heat and bring back to a simmer. Season to taste with salt and pepper. In a small bowl, cream together butter and flour; whisk into soup, stirring constantly until thickened slightly. Makes 4-6 servings.